A few months ago, I gave a brief presentation on long term care for the elderly and disabled. As I contemplate my own mortality, that of my parents and the people I come into contact daily– I thought I’d write a post about it. It’s a little long, but I promise you’ll learn something valuable. Americans tend to think, “I have medical insurance so I’m covered.” And while this may be true for routine medical care, doctor’s visits, prescriptions and in-patient hospitalization and some types of rehabilitation, it does not extend to long-term care. 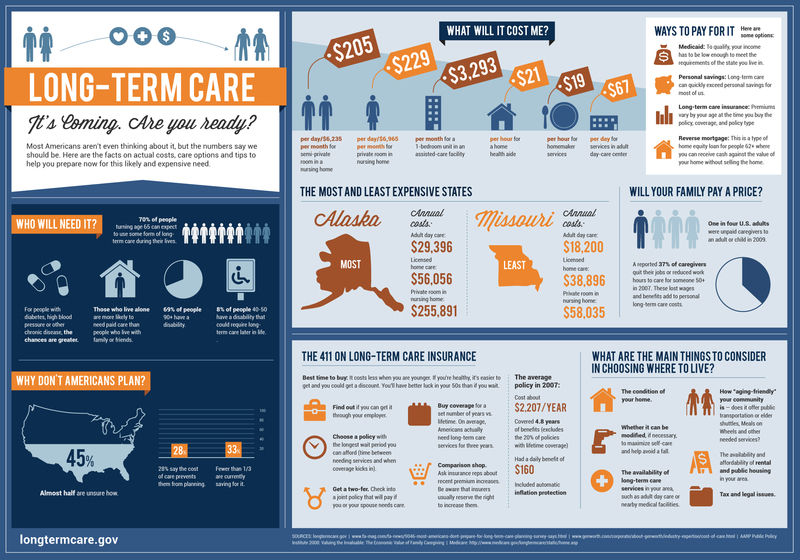 What is long-term care? I could define it, but the National Institutes of Health does a better job explaining it. When we hear “long-term care” we often visualize an older person, but that is not always the case. Anyone can become ill at any time and require long term care in a facility. As Americans we are living longer due to better medical care, advances in science, environmental factors and, if you’re lucky, good genes. Inevitably, no matter your genes, you will become ill. We just do not know from what-or when. Most of us are not prepared to finance our long term stays in a nursing home. And it’s expensive, more expensive than paying for one year of university (private or public), a wedding and in some states, a year’s worth of mortgage payments. During my presentation I referenced this infographic and the dollars and cents really do make it real. It is worth a look. Thankfully, there are ways to plan the financing of long term care. The earlier you do it, the more options you have. While none of the options are cheap, the later options are much more costly – and I am not just referring to money. a) Private pay. This is exactly what it means. You or a loved one pays out of pocket for your long-term in care in a facility. Most of us will far outlive our savings, especially in light of the very high financial cost associated with aging. But, if you are one of the relatively few who find themselves in the exclusive tax bracket of “exceedingly wealthy”- congratulations. Now, for the rest of us. Again, the earlier you plan the better off you are. Because once you become ill, this type of insurance is no longer available to you. One caveat: LTC insurance will likely not cover your entire long term care needs for the time you will require it. The latter is assuming you live past the period for which it will cover your needs i.e. the money runs out before you die. LTC insurance is meant to be a cushion of sorts, to delay or prevent spending out of pocket, parting with your assets, or applying for Medicaid. Applying for Medicaid is the next step for many, but it is not without challenges. c) Medicaid. It is a needs based insurance program. In simplest terms, you must meet certain income and resource limits in order to qualify. And those limits are low- and in some people’s opinions- almost near indigency. About 2/3 of nursing home residents rely on Medicaid for their medical coverage and a majority of those people worked with an attorney in order to qualify because they had “too much” in assets. And you’d be surprised to learn what “too much” is. Unlike long term care insurance, Medicaid does not “run out” and will continue to cover your medical care —as long as you meet income and resource eligibility. It can quite possibly cover your long term care needs until your death. Very important, Medicaid is the only health insurance that covers long term care; Medicare has never and will never do so. This link provides a succinct overview of the income and resource limits required in my home state, New York. d) Reverse Mortgage. This is an option for individuals who are at least 62 years old and have either paid off their mortgage completely or have way more equity in their home than a mortgage balance. The amount of the reverse mortgage should be sufficient to pay off their mortgage (if necessary), live in the home and maintain it, pay off bills or debts of any kind, fund home renovations or to have a “nest egg” for the unexpected. You can obtain a reverse mortgage and never touch a penny of it. I have little experience with reverse mortgages, so I will let US. Department of Housing and Urban Development (HUD) provide further information here. Lastly, and as a bonus for reading this post to the end, is one last infographic painting a literal picture of financing aging in the U.S. Pictures definitely tell a story. Do yourself a big favor, plan and plan early…and share this post with others! My forthcoming post will be about how legal protection, in the form of a trust document (and other legal mechanisms), can safeguard your assets as you anticipate long term care needs in your future. To properly plan, you will need a lawyer in your corner.